Pinterest has a lot to answer for! I've been aware for quite some time that a baby blue nursery wasn't for us. There's so much inspiration online that I found I really wanted to go bold! Thanks to awesome ideas from over the pond we hoped that we could achieve something a little different. Bean and I love the bold colours of 'jungle themes' but didn't actually want a jungle theme, or any animal mural ideas going on . 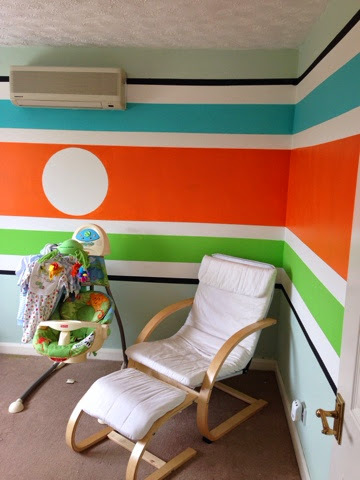 We just wanted a relatively timeless/ ageless decor that would grow with our little boy. 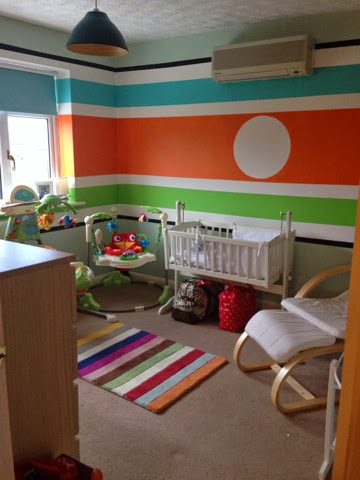 We knew that stripes were our goal, we searched for paper but alas it couldn't be found in a colourway we liked, so instead, we embraced the frog tape and Bean made the stripes himself!! We are both over the moon with the outcome! It is indeed (to me) very Pinterest! Its different but not crazy. The colours are bold, but familiar. Its a stimulating palette, but hopefully still enough to allow baby to sleep. Its nothing short of everything I wanted! The circle might well look odd, but for those race car lovers out there you will probably realise there will be something going in that space. Not a number though, no! Baby's first initial will go into that space once he is here and we are 100% sure on his name! In time the cotbed will go in here andthe crib (without those bumpers I might add) will be in our room. This room makes me so very happy! Its perfect for our tastes! I just hope little monkey likes it too!! There's more room reveals to share, such as inside the wardrobe and the drawers etc. I think those will be best saved for a video instead! !